(3:50 p.m., Tuesday, Dec. 13, 2016) The Portland Bureau of Transportation warns the traveling public to be prepared for severe winter weather that may create hazardous traveling conditions during the Wednesday evening rush hour. The National Weather Service has advised the City of Portland to expect 1 inch to 2 inches of snow over a six-to-eight-hour period, starting around noon to 1 p.m. While neighborhoods at elevations above 500 feet often experience more snow and ice accumulation than the rest of Portland, forecasters say the snow accumulations could vary widely at low elevations across the metropolitan area. Some low-elevation sites may have more snow than high-elevation areas, because forecasters expect narrow bands of heavy snow to move across the region throughout the afternoon and early evening. There is some uncertainty in the forecast. There is a 20 percent or less chance that the Portland area sees less than 1 inch or more than 3 inches of snow, the Weather Service says. The Wednesday afternoon forecast also could change by Wednesday morning. Freezing rain is not expected, but freezing temperatures are expected through the weekend. NW Cornell Road is expected to remain closed through the upcoming storm and freezing conditions, staying closed potentially through the weekend. Trees remain in the landslide area, and heavy equipment creates risk for pedestrians who violate the work zone. The site still lacks electricity for street lights and lighting in the tunnel. Damage to power lines and telecommunication infrastructure needs to be repaired. No through traffic is allowed, and only local access is allowed on Cornell east of NW Thompson and west of NW Westover. PBOT dispatch received 687 phone calls and created 426 service requests, nearly all for downed trees, from 6:30 a.m. Thursday, Dec. 8 through 6 a.m. on Saturday Dec. 10, according to figures the bureau is releasing today. While the snow forecast may still be uncertain, it never hurts to be prepared! What's it like to drive a snow plow? 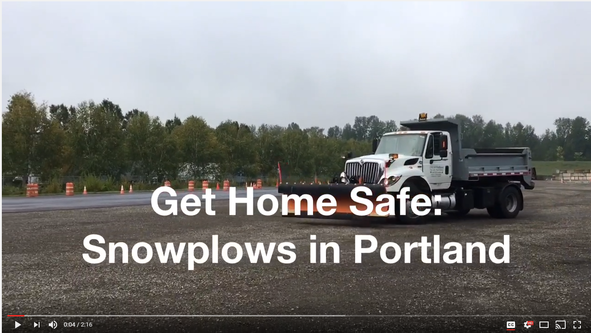 We invited our friends from AAA Oregon/Idaho, AARP Oregon, and The Street Trust (formerly the Bicycle Transportation Alliance) to take our snowplows for a spin at our annual snowplow training event for PBOT crews in October. Video by Hannah Schafer, Portland Bureau of Transportation. PBOT crews worked overtime during last week's snow and ice storms. PBOT crews worked mainly on storm response from 6:30 a.m. Thursday, Dec. 8 through 6 a.m. on Saturday Dec. 10. Crews set up trucks with plows, sanders and chains by 3 p.m. on Wednesday, in case the storm came early. Some staff also worked through the weekend and are still working to clear streets of tree debris. Applied 22,000 gallons of anti-icer (MgCl) and 868 cubic yards of sand. Covered plow routes totaling 1,120 lane miles with a separate 260 lane miles of anti-icing. Each route was plowed or anti-iced many times by various trucks. Handled 687 phone calls and created 426 service requests, nearly all for downed trees. PBOT Dispatch at 503-823-1700 handles all after-hours and weekend calls for Portland Parks & Recreation's Urban Forestry Division. As of Monday, most of the 260 “tree down” locations still have debris in place and PBOT is coordinating with Parks to assist them in tree debris removal. Used at least $16,000 in materials. Labor costs are still being tallied. Work continues to clear the landslide on NW Cornell as quickly and safely as possible. PBOT sets up chain-up areas in the shoulder heading uphill on West Burnside and SW Sam Jackson Parkway. 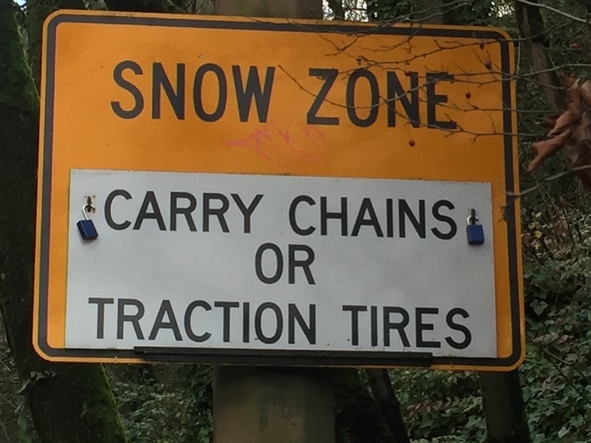 They are set aside as a safe place for people to attach snow chains during a storm. Parking is not allowed in these areas and vehicles abandoned there are subject to towing. PBOT crews applied 8,100 gallons of anti-icer on Monday night, and expect to apply more to try to prevent snow or ice accumulation. Leaf Day service will be provided as scheduled Wednesday morning, for as long as conditions allow. The city's fleet of more than 50 snow plows will be ready by noon. Parking enforcement officers will be in place to tow abandoned vehicles during the evening rush hour. Plows are not able to move snow accumulations of 1 inch or less, so people who insist on driving should be prepared to drive on snow. Buy chains, practice putting them on your car, carry them in your vehicle, and use them. You may need them unexpectedly. During snow storms, PBOT often requires chains or traction devices on West Burnside and SW Sam Jackson Parkway.